Groupon has a deal on hotels and travel today only! 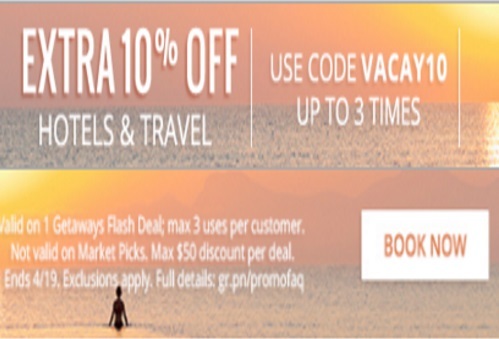 Save 10% off your hotels and travel deal with the promo code below! Enter the code VACAY10 at checkout. Offer is valid today only, Tuesday, April 19, 2016. Can be used up to 3 times per member. Maximum discount can be up to $50 per deal.